Fifty years ago, on October 1, 1962, James Meredith attempted to enroll at the University of Mississippi in Oxford. What happened next has been called “The Last Battle of the Civil War” as the college town erupted in rioting that left 2 people dead, and 20 injured. A force of more than 3000 soldiers and guardsmen and 400 deputy United States Marshalls fought for 15 hours to restore order. Paul Hendrickson chronicles the lives of six southern sheriffs who were in Oxford before the riot and had their picture taken. (The picture is on the cover of this book.) These sheriffs (each from a different county) all knew each other and were part of the Mississippi State Sovereignty Commission, which was a state sponsored and tax supported agency whose purpose was to keep an eye out for blacks who would get out of line. They represented the tip of the segregation spear, the enforcers of the Jim Crow regime. All were complicit. Some were more enthusiastic than others. Most or all believed that the black man was inferior and that “civil rights” was being imposed by outside agitators. Hendrickson interviews friends and family and some of the Officers who were still alive. He tells the strange story of James Meredith himself who was soldier like in his duty to destroy segregation but whose subsequent life was itinerant and delusional. Finally he contacts the descendants of the sheriffs and learns how life in the south changed after civil right and somehow stayed the same. I enjoyed one of Hendrickson’s previous excellent books: Hemingway’s Boat : Everything he loved in life and lost 1934-1961. He makes his narrative come alive. 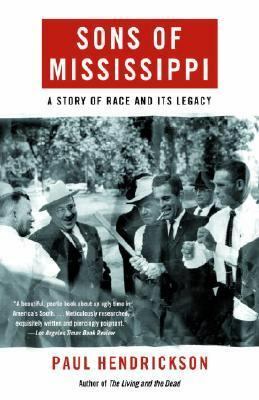 You smell the rich earth of the Mississippi delta, feel the sweltering heat, and mostly wonder how such a world could exist where men could treat their fellow men like animals.